Persistence Market Research (PMR) analyzes the global centrifugal industrial dryer market in a new publication titled “Centrifugal Industrial Dryer Market: Global Industry Analysis (2012 – 2016) and Forecast (2017 - 2025)”. This study provides data for 2016 along with a comprehensive forecast for the period 2017–2025. The main objective of the report is to identify dynamics in the market and provide recent updates and insights impacting various segments of the global centrifugal industrial dryer market. To provide better understanding of the market, the report also includes the analysis of drivers, restraints, and trends on all five regions namely North America, Europe, Latin America, Asia Pacific and the Middle East & Africa, which influence the current market scenario and future status of the global centrifugal industrial dryer market over the forecast period. PMR has developed a market attractiveness index to understand the key segments in terms of their performance and growth in the global centrifugal industrial dryer market. This market attractiveness index would help clients identify real market opportunities in the global centrifugal industrial dryer market. Centrifugal dryer is a preferred choice in the metal finishing and recycling industry due to its capability to provide uniform drying for lightweight plastic solid. The growth of the global plastic recycling industry is projected to significantly boost market revenue growth. Centrifugal industrial dryer is expected to witness high demand from metal finishing/electroplating applications. The global demand for centrifugal industrial dryer was approximately 7,712 units in 2016. Sales revenue of centrifugal industrial dryer is expected to register a CAGR of 3.9% over the forecast period (2017–2025). The global centrifugal industrial dryer market is expected to gain traction owing to healthy growth in the domestic and export market for automotive components in the coming years. Centrifugal dryers are best suited for lightweight and small-sized parts in various end-use industries, such as metal finishing/electroplating, food & beverages, pharmaceutical and chemical, among others. Additionally, manufacturers in the market provide tailor-made products as per end-user requirements. Such benefits act as a major factor supplementing the adoption of centrifugal industrial dryers. However, the market for centrifugal industrial dryers is largely dominated by products such as fluidized bed dryers, spray dryers and flash dryers, among others. 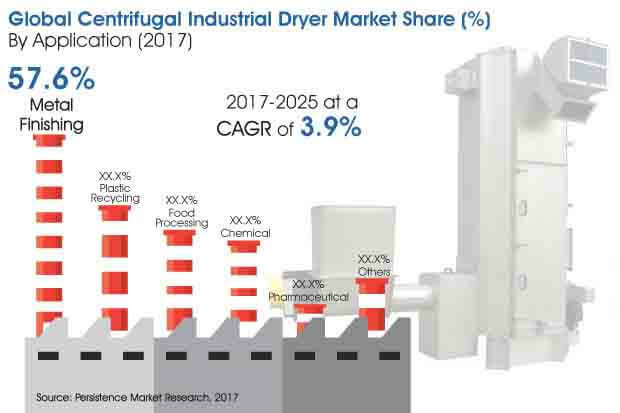 The fluidized and spray dryers collectively hold nearly half of the total industrial dryer market sales, whereas centrifugal dryer has always been a niche product category that has limited application and its use is limited to small-sized and lightweight products. The product struggles for focus by manufacturers as it has limited demand and low profit margins as compared to the other industrial dryer products. This can restrict market revenue growth in the coming years. Of the different applications utilizing centrifugal industrial dryers, demand from the metal finishing application is anticipated to dominate the global market in the coming years. The metal finishing segment by application is projected to lead the global centrifugal industrial dryer market in terms of revenue share, estimated to hold a value share in excess of 55% throughout the forecast period. Plastic recycling is the second largest segment in the global centrifugal industrial dryer market in terms of value, estimated to hold a revenue share of around 16% throughout the forecast period. The metal finishing segment was valued at US$ 108.3 Mn in 2016 and is estimated to reach US$ 112.4 Mn by 2017 end. This segment is expected to create an incremental $ opportunity of US$ 46.7 Mn during the forecast period and is anticipated to reach a market valuation of US$ 159.1 Mn by the end of the forecast period in 2025. The plastic recycling segment was valued at US$ 31.0 Mn in 2016 and is estimated to reach US$ 32.0 Mn by 2017 end. This segment is expected to create an incremental $ opportunity of US$ 9.3 Mn during the forecast period. The segment is expected to reach a market valuation of US$ 41.3 Mn by the end of the forecast period in 2025. The plastic recycling segment is expected to grow by about 1.3X over the forecast period. Other applications of centrifugal industrial dryer include applications such as oil & gas, agricultural and other industrial manufacturing. The others segment is expected to hold a relatively low market share in the global centrifugal industrial dryer market over the forecast period.